At first glance, this might not seem the easiest way to spend an evening: three Shakespeare plays back-to-back, lasting six hours and performed entirely in Dutch. 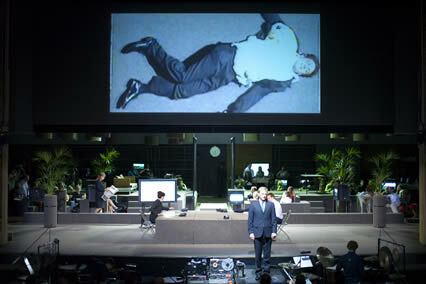 However The Roman Tragedies is probably one of the most exhilarating theatrical experiences of the year. Presented here at the Barbican by Toneelgroep Amsterdam, the foremost Dutch theatre company, Coriolanus, Julius Caesar and Antony and Cleopatra are performed consecutively, as per their timelines which gives a pleasing flow to the evening: there’s a real sense of a grand narrative to the whole evening, of the developing nature of politics and democracy and how it is communicated to the masses. It opens on a large stage with the cast spread over a number of sofas and ministages, and the play is delivered in a normal fashion with surtitles provided on a large screen above. Then as the first break approached, some consuls appeared in the middle of the audience to deliver their scene, giving you the first indication that this would be no ordinary production. During that first break (rather than normal intervals, the action is interspersed with short breaks), the audience were invited to come onto stage and watch from the sofas: there was also a bar where you could buy a drink and computers to check your email, you could really immerse yourself in the action and become part of the play, a citizen of Rome if you will, whilst the political debates of war and democracy rage around you. I particularly loved the scrolling news flashes which reminded us of the length of time until the deaths of each of the key characters, it was so witty I didn’t even mind that it was 295 minutes until Cleopatra’s death! There is much use of multimedia so many scenes are recorded and played live on a selection of small screens and a big screen upfront, giving you the choice of watching the big picture, or the video close-up and there were often times when you wanted to watch it all. The beauty of this interpretation, in stripping back these plays to the political struggles and excising all the battle scenes, meant that whilst you were witnessing high politics play out, you were also able to watch the impact it had on the other characters: the pain on Coriolanus’s wife’s face as he is exiled, the unease of the Senate as Mark Antony eulogises the fallen Caesar, Cleopatra’s ladies-in-waitings’ anguish at their distraught queen. Acting wise, th ere’s so many excellent performances it is hard to pick out some: the lead performances were all strong and these players were generally rested in the other sections, but the supporting players had much to do in each of the plays so they were working extremely hard: Marieke Heebink in particular was rarely off-stage and gave great pathos as Casca and then comedy as Charmian. Elsewhere, Frieda Pittoors’ indomitable Volumnia and Renée Fokker’s icily manipulative Cassius were great treats. But the true standouts for me were Hans Kesting as Antony and Chris Nietvelt as a simply astonishing Cleopatra. Kesting was recently injured but gamely performed with a plaster cast on and in a wheelchair but this rarely interfered in a stirring performance through his two plays, mixing a touching nobility with a raunchy virility which gave his relationships a real authenticity: none more so than with Nietvelt’s Cleopatra. 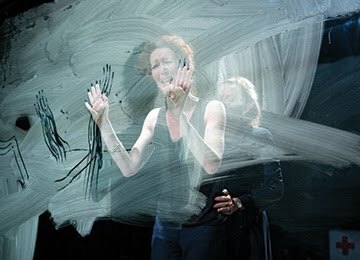 This was an impassioned performance which often transcended language, there were times when I just watched her instead of the surtitles and I knew exactly what she was saying. There’s only one night left of this, but by jove I recommend it (despite the live snake on stage, eek): a theatrical experience like no other that will remain with me for quite some time.